The development of ceramic matrix composites (CMCs) was in order to overcome the intrinsic brittleness and due to lack of mechanical reliability of monolithic ceramics, which are otherwise attractive for their high stiffness and strength [1, 2]. This results in enhanced strength, toughness and flaw tolerance [3-5]. Since its development, ceramic matrix composites have been receiving increasing attention from many researchers due to their enhanced mechanical properties, low-temperature densification, machinability, and superplastic behavior [6-8]. Many researchers have reported their findings on mullite related ceramic composites. Das and Banerjee  reported on zirconia-mullite composites prepared through reaction sintering using zircon flour, alumina and dysprosia as sintering additive. Nicolas et al. 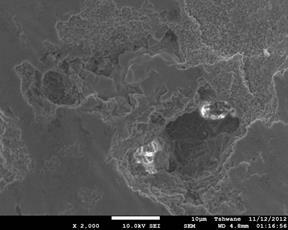 reported on zirconia-mullite composites prepared through two different processing routes, which are reaction sintering of alumina and zircon and direct sintering of mullite-zirconia grains by slip casting and sintered at 1600°C for 2 h. Ozturk  prepared textured mullite-zirconia composites from a reactive mixture of alumina and zircon powders together with acicular aluminum borate templates. Ebadzadeh and Ghasemi  reported on zirconia-mullite composites prepared using α-alumina and aluminium nitrate and zircon powder with TiO2 as additive. 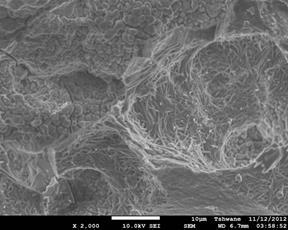 Moreover, Aramide et al.,  reported on mullite fibre reinforced zircon-zirconia refractory ceramic composite from clay based materials. They synthesized mullite from the kaolinite contents of the clay used, while zircon was formed through reaction sintering of zirconia with silica contents of the clay and the excess silica from the mullitization process. Furthermore, Aramide et al. 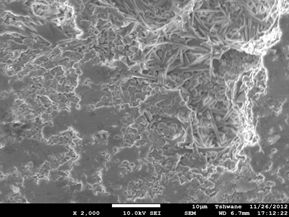 synthesized mullite-zirconia composites containing yttria as additive. There has been little or no information on the production and prospect of mullite-carbon ceramic composite. Aramide et al. had synthesized mullite-carbon composite from the same materials without any additive. It was discovered that the amount of microcline content in the samples at all sintering temperatures was less than 1%. The aim of the present work is to examine the effects of sintering temperature and addition of silicon carbide on the phase evolutions of ceramic composite produced from kaolin and graphite. Clay sample used for this study (as mine Kaolin sample) was sourced from Okpella, Edo State southern part of Nigeria, Graphite and silicon carbide (SiC) were sourced from (Pascal Chemicals, Akure), this were used to maintain the granulometry of the mixture. Figure 1 below shows the flow sheet of the method. The raw materials graphite and kaolin were crushed into a coarse particle size, of about 10 mm for graphite and less than 2 mm for kaolin; the crushed samples were further reduced by grinding using Herzog rod mill. The powdered samples were sieved using 600 μm sizes aperture according to ASTM standards in an electric sieve shaker. The undersize that passed through the 600 μm sieve aperture were used in the samples making. The samples were carefully prepared for these analyses by digesting in reagents as described by . The mineralogical phases present in the samples were determined using X-ray diffractometry (XRD). The samples were prepared for XRD analysis using a back loading preparation method . They were analysed using a PANalytical X’Pert Pro powder diffractometer with X’Celerator detector and variable divergence- and receiving slits with Fe filtered Co-Kα radiation. The phases were identified using X’Pert Highscore plus software. The receiving slit was placed at 0.0400. The counting area was from 5 to 700 on a 2θ scale. The count time was 1.5s. The temperature-scanned XRD data were obtained using an Anton Paar HTK 16 heating chamber with Pt heating strip Graphical representations of the qualitative result follow below. The relative phase amounts (weight %) was estimated using the Rietveld method (Autoquan Program) as reported by Young et al . Amorphous phases, if present were not taken into consideration in the quantification. Where: ρmixture - density of the mixture; Mmixture - the mass of the mixture; Wtf. kaolin - the weight fraction of kaolin; ρkaolin - the density of kaolin; Wtf.graphite - the weight fraction of graphite; ρgraphite - the density of graphite and vol.mould - volume of mould. The raw materials in the samples making were 3:2vol. % of kaolin and graphite respectively with the addition of 4 and 8 (vol.) % silicon carbide respectively. The mixture were blended thoroughly for proper distribution of constituents materials in a ball mill for 3 hours at a speed of 72 rev/min after weighing via electronic weighing balance in accordance with the composition calculation initially prepared [13, 19]. The resulting blended compositions were mixed with 10% water, the amount of kaolin content in each composition; this was in order to enhance the plasticity of the mixture during compaction. The mixed samples were subjected to uniaxial compaction, which was carried out mechanically under pressure. The molded materials were fired at varying temperatures (13000C, 14000C and 15000C) in an electric furnace. 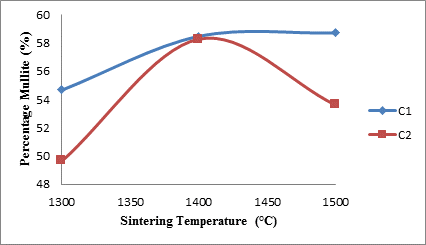 The rate of firing differs with increased temperature (room temperature to 5000C the sintering rate was 250C/minute, 5010C to 10000C the sintering rate was 100C/minute while above 1000°C the sintering rate was 3°C/minute). On reaching the various sintering temperatures, the samples were held for one hour at the temperature before the furnace was switch off and the samples were allowed to cool in the furnace. The samples were subjected to various test to examine the phase analysis, evaluate their physical and mechanical properties. Morphology and microanalysis of the clay and composite samples were determined using ultra-high resolution field emission scanning electron microscope (UHR-FEGSEM). The pulverized clay samples/sintered ceramic composite samples were previously gold coated. The samples were studied using ultra-high resolution field emission scanning electron microscope (UHR-FEGSEM) equipped with energy dispersive spectroscopy (EDS). Particle images were obtained with a secondary electron detector. 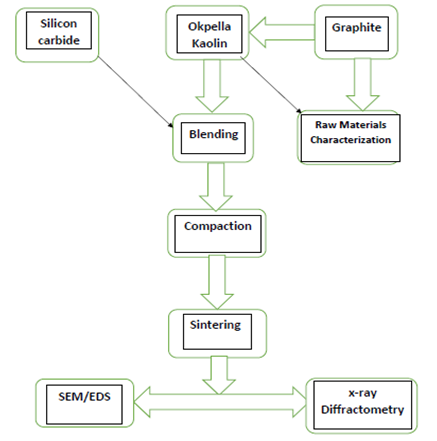 Table 1 shows the quantitative and qualitative of different phase’s xrd results of the raw kaolin and graphite used for the research. Table 2 show the quantitative and qualitative xrd results of the phases developed in the samples sintered at various temperatures. Figures 2 to show the effects of sintering temperatures and silicon carbide additive on the diferent phases formed in the various samples. From the figure 2 it is observed that both the sintering temperature and the varied percentage silicon carbide additive affect the phase developments in the various samples. The phases/mineralogical compositions of the raw materials have been discussed by Aramide  they are only reported for the purpose of showing that the compositions of the starting raw materials were known. 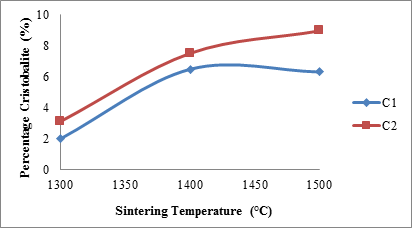 Figure 2 shows the effects of sintering temperature on the percentage graphite content of the various sintered ceramic samples. From the figure 2, it is observed that for sample C1 (sample with 4 vol. % silicon carbide) the graphite content progressively reduced linearly with increased sintering temperature. This could be attributed to fact that graphite is prone to oxidation at temperatures above 900°C . Moreover, it is observed that for sample C2 (sample with 8 vol. % silicon carbide), the graphite content of the sample at 1300°C was around 22%, it however reduced to around 19% as the sintering temperature was increased to 1400°C; further increase in the sintering temperature to 1500°C subsequently lead to increase in the graphite content to around 20.5%. Because an electric furnace was used for sintering the samples, (not combustion furnace) and the air in the furnace at the sintering temperature will not be sufficient for complete oxidation of the silicon carbide. This could account for the slight increase in the amount of graphite at 1500°C. The increased amount of silicon carbide in sample C2 favours the formation of silicon mono-oxide and carbon or graphite, further reaction with oxygen by the silicon mono-oxide leads to the formation of silica. Furthermore, from the same Figure 2, it is observed that sample C2 at all sintering temperatures contains more graphite than sample C1. This could be due to anti-oxidation effect of silicon carbide on the graphite content . It has been reported that silicon carbide undergoes mostly passive oxidation  during which silica is liberated. This silica forms dense layer on the surface of the graphite which acts as a protective barrier on the graphite against oxygen penetration . Figure 3 depicts the effects of sintering temperature and the amount of silicon carbide on the mullite content of the samples. From the figure it is observed that for sample C1, the amount of mullite content of the samples increased with increased sintering temperature. From the xrd results of the raw materials used in producing the samples , it is clearly shown that there was no mullite in the raw materials. The mullite content was developed through solid state high temperature transformation of kaolinite content of the raw kaolin (a process known as mullitization process) to mullite and excess silica as reported by many researchers [2, 13, 23]. The formation of the excess silica is corroborated Figure 3, which will be discussed in the next section. Moreover, from the same figure it is observed for sample C2 that the mullite content initially increased from about 50% at 1300°C with increased sintering temperature to its maximum of about 58% at 1400°C. Moreover, it is observed that further increase in the sintering temperature lead to reduction in the mullite content to about 54% at 1500°C. The reason for the different behavior of the mullite contents in samples C1 and C2 when the sintering temperature was increased from 1400°C to 1500°C could be attributed to the fact that the raw kaolinite has been used up for sample C2 at 1400°C. Even though Figure 3 shows that the mullite content of sample C2 reduced when the sintering temperature was increased from 1400°C to 1500°C, what actually happen was that more silica was produced in sample C2 through the passive oxidation of silicon carbide as earlier explained. Figure 4. Showing the scanning electron microscope images of the investigated samples. (a) C1 (1300°C), (b) C1 (1400°C), (c) C1 (1500°C), (d) C2 (1300°C), (e) C2 (1400°C), (f) C2 (1500°C). 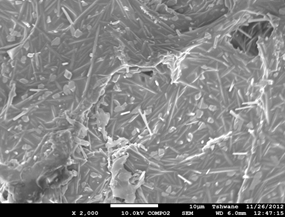 Mullite fibers could be clearly seen in the micrographs. Furthermore, it is observed that the mullite contents of samples C1 at all temperatures are higher than those of samples C2. This because samples C2 (8 vol. % silicon carbide) has less amount raw kaolinite compare to samples C1 (4 vol. % silicon carbide). Figure 4: (a), (b), (c), (d), (e) and (f) show the scanning electron microscope (SEM) images. 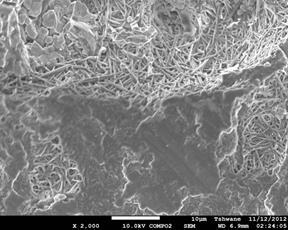 From the SEM images the mullite fibers are conspicuously seen. Figure 5 shows the effects of sintering temperature and silicon carbide additive on the cristobalite (silica) content of the samples. From the figure it is observed that the silica content of sample C1 at sintering temperature 13000C was about 4%. It then increased to about 6.5 % with increased sintering temperature to 14000C, further increase in the sintering temperature to 15000C lead to slight reduction in the silica content of the sample. Similarly, it is observed that the silica content of samples C2 increases with increased sintering temperature. As it was earlier explained in the preceding sections; the silica content of the samples originates from two separate processes. These processes are, passive oxidation of silicon carbide [21, 22] (which is more prevalent in samples C2) and the process of mullitization (common to both samples C1 and C2). This explains the reasons for higher values of cristobalite (silica) contents of samples C2 at all temperatures than that of samples C1. 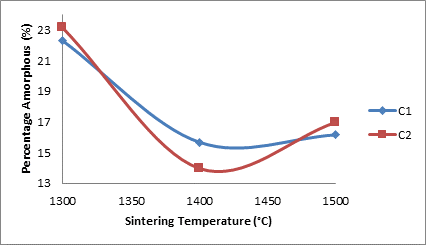 Figure 6 shows the effects of sintering temperature and silicon carbide additive on the microcline content of the sintered ceramic samples. From the figure it is observed that for sample C1, the microcline content of the samples initially reduced from about 1.55% at 1300°C to about 0.96% at 1400°C. Furthermore, increase in the sintering temperature to 1500°C lead to slight increase in the microcline content of the sample to about 1.2%. Moreover for sample C2, its microcline content follows. The same trend as sample C1 with increase in sintering temperature. It is also observed that the microcline content of samples C2 is higher than that of samples C1 at all sintering temperatures. It could be reasonably inferred that addition of more silicon carbide aids the formation of microcline (feldspar) which aids liquid phase sintering and promotes formation of mullite fibres [24, 25]. 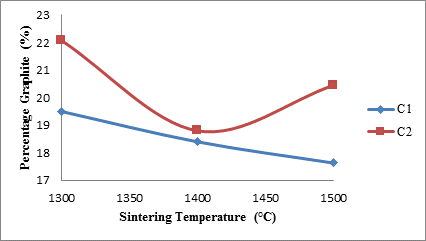 Figure 7 shows how the addition of silicon carbide and the sintering temperature affect the amorphous content of the samples. 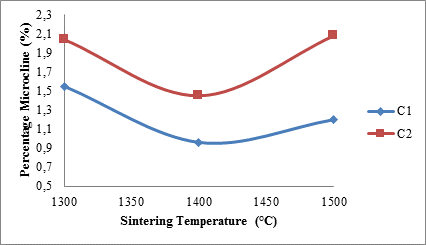 From the figure 7 it is observed that the amorphous content generally decreased with increased sintering temperature for both samples. This could mean that the amorphous transforms to crystalline phases. Generally the graphite content progressively reduced linearly with increased sintering temperature. The kaolinite content of the raw kaolin undergoes transformation into mullite and excess silica, in which the contents of both increased with increased sintering temperature. The excess silica produced during mullitization process also improved the oxidation resistance of the graphite content. The addition of more silicon carbide aids the formation of microcline (feldspar) which aids liquid phase sintering and promotes formation of mullite fibres. Silicon carbide acts as anti-oxidant for the graphite, this anti-oxidant effect was more effective at 8 vol % silicon carbide. The authors acknowledge the Science Initiative Group (SIG), based at the Institute for Advanced Study in Princeton, for the support of this research work through the Competitive Fund for RISE Graduates Phase I (Round 1 and 3). Without this fund, it would have been extremely difficult to achieve the objectives of this research work. 1. Chawla K.K., Ceramic matrix composites. 2 ed. ; Kluwer Academic Publishers: 2003. 2. Aramide F.O., Alaneme K.K., Olubambi P.A., Borode J.O., In-Situ synthesis of mullite fibers reinforced Zircon-Zirconia refractory ceramic composite from clay based materials, International Journal of Materials and Chemistry 2015, 5 (6), p. 127-139. 3. Bermejo R., Torres Y., Sanchez-Herencia A. J., Baudin C., Anglada M., Llanes L., Residual stresses, strength and toughness of laminates with different layer thickness ratios, Acta Mater, 2006, 54 (18), p. 4745–4757. 4. Bermejo R., Danzer R., High failure resistance layered ceramics using crack bifurcation and interface delamination as reinforcement mechanisms, Eng. Fract. Mech, 2010, 77 (11), p. 2126–2135. 5. Náhlík L., Šestáková L., Hutar P., Bermejo R., Prediction of crack propagation in layered ceramics with strong interfaces. Eng. Fract. Mech, 2010, 77 (11), p. 2192–2199. 6. Andres R.P., Averback R.S., Brown W.L., Goddard III W.A., Kaldor A., Louie S.G., Moscovits M., Peercy P.S., Riley S.J., Siegel R.W., Spaepen F., Wang Y., Research opportunities on cluster and cluster-assembled materials. J. Muter. Res., 1989, 4 (3), p. 705-736. 7. Siegel R.W., Ramasamy R., Hahn H., Tiang L., Gronsky R., Synthesis, characterization, and properties of Nanophase TiO, J. Muter. Res., 1988, 3, p. 1367-72. 8. Niihara K., New design concepts of structural ceramics- ceramic Nanocomposite, J. Ceram. Soc. Jpn, 1991, 99 (10), p. 974-82. 9. 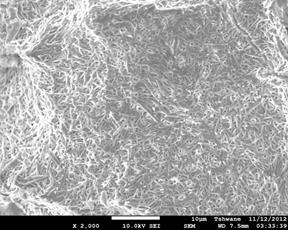 Das K., Banerjee G., Mechanical properties and microstructures of reaction sintered mullite-zirconia composites in the presence of an additive - dysprosia, Journal of the European Ceramic Society, 2000, 20 (2), p. 153 -157. 10. Rendtorff N.M., Garrido L.B., Aglietti E.F., Thermal shock behavior of dense mullite-zirconia composites obtained by two processing routes, Ceram. Int., 2008, 34 (8), p. 2017-2024. 11. Ozturk C., Tur Y.K., Processing and mechanical properties of textured mullite/zirconia composites, J. Eu. Ceram. Soc., 2007, 27, 2-3, p. 1463-1467. 12. Ebadzadeh T., Ghasemi E., Effect of TiO2 addition on the stability of t-ZrO2 in mullite ZrO2 composites prepared from various starting materials, Ceramics Int., 2002, 28, p. 447–450. 13. Aramide F.O., Alaneme K. K., Olubambi P. A., Borode J. O., Effects of 0.2Y-9.8ZrO2 addition on the mechanical properties and phase development of sintered ceramic produced from Ipetumodu clay, ANNALS of Faculty Engineering Hunedoara – International Journal of Engineering, 2014, 7 (4), p. 343-352. 14. Aramide F.O., Akintunde I.B., Oyetunji A., Insitu synthesis and characterization of mullite-carbon refractory ceramic composite from Okpella kaolin and graphite, Usak University Journal of Material Science, 2016, p. 25-42. 15. Nabil R.B., Barbara Z., Sample preparation for atomic spectrometric analysis: An overview, Advances in Applied science research, 2012, 3 (3), p. 1733-1737. 16. Kleeberg R., Monecke T., Hillier S., Preferred orientation of mineral grains in sample mounts for quantitative XRD measurements: How random are powder samples?, Clays and clay minerals, 2008, 56 (4), p. 404-415. 17. Young R.A, Sakthivel A., Moss T.S., Paiva-Santos C.O., Rietveld analysis of X-ray and neutron powder diffraction patterns, School of physics, Georgia institute of technology, Atlanta, U.S.A. 1994. 18. Surappa M.K., Aluminium matrix composites: challenges and opportunities, Sadhana, 2003, 28, Parts 1 & 2, p. 319-334. 19. Aramide F. O., Effects of sintering temperature on the phase developments and Mechanical properties ifon clay. Leonardo Journal of Sciences 2015, 26, p. 67-82. 20. Zhang H.Y., Wang H.Q., Chen G.H., A New Kind of Conducting Filler- Graphite Nano sheets, Plastics, 2006, 35(4), p. 42-50. 21. Auweter-Kurtz M., Hilfer G., Habiger H., Yamawaki K., Yoshinaka T., Speckmann H.D., Investigation of oxidation protected C/C heat shield material in different plasma wind tunnels, Acta Astronau., 1999, 45, p. 93. 22. Roy J., Chandra S., Das S., Maitra S., Oxidation behaviour of silicon carbide - A review, Rev.Adv.Mater. Sci., 2014, 38, p. 29-39. 23. Srikrishna K., Thomas G., Martinez R., Corral M.P., Aza S.D., Moya J.S., Kaolinite‐Mullite reaction series: A TEM study, J. Mater. Sci., 1990, 25, p. 607‐612. 24. Aramide F. O., Alaneme K. K., Olubambi P. A., Borode J. O., Characterization of some clay deposits in South West Nigeria, Leonardo Electronic Journal of Practices and Technologies, 2014, 25, p. 46-57. 25. Sedmale G., Sperberga I., Sedmalis U., Valancius Z., Formation of high-temperature crystalline phases in ceramics from Illite Clay and Dolomite, J. Eur. Ceram. Soc., 2006, 26 (15), p. 3351-3355.